India's Largest Landline service provider, Bharat Sanchar Nigam Limited (BSNL) has decided to introduce Credit Limit Monitoring (CLM) system in Landline / Broadband services in all BSNL telecom circles across India. For each customer, the system will set a Credit Limit as per their previous bills / deposit amount. BSNL customers will receive SMS / IVRS / e-mail alerts when their unbilled usage crosses their Credit Limit. When the unbilled usage crosses 120 percent of Credit Limit, an Advance Payment Note (APN) will be generated and customers may make payment as per the generated advance payment note to enjoy continued services. Two alerts shall be generated by the Credit Limit Monitoring (CLM) system when unbilled usage approaches the Credit Limit or exceeds it. Now, BSNL has decided to implement uniform levels of 1st and 2nd alerts for all types of connections - at 90 percent and 120 percent of Credit Limit respectively. Deposit amount at credit in the customer account. The following procedure will be followed for deriving notional free usage out of the unbilled usage for deciding CLM Limit. Unbilled usage shall be monitored daily or as part of the rating process, for all customers including e-stapling and Hierarchy billing as well as VIP/VVIP categories. Excess payment if any, against the account shall be adjusted to assess the total unbilled usage to be considered for CLM. Two alerts shall be generated by BSNL system when unbilled usage approaches the Credit Limit or exceeds it. After updating the Mobile number and e-mail id of customer through BSNL Database, SMS / e-mail alerts will be sent to the customer, if unbilled usage considering excess payment etc. Customers who received Advance Payment Note (APN), may make their payment in their nearest BSNL customer care to enjoy uninterrupted services. In case the customer does not make payment and is likely to be a defaulter then BSNL shall bar the services offered to him. The services will be restored only after making payment as per the generated Advance Payment Note (APN). 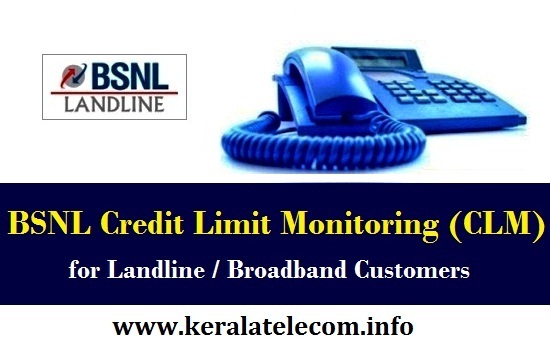 BSNL has decided to launch this facility 'Credit Limit Monitoring (CLM)' from 15-06-2015 onwards across all telecom circles in India. Dear readers, please share your views and opinions about the newly introduced Credit Limit Monitoring (CLM) system by BSNL via comments with us.